Antelope Valley Winery is one of only two operating in the proposed AVA. Wineries and grapegrowers urge Antelope Valley winegrowing district. Lancaster, Calif. — The Alcohol and Tobacco Tax and Trade Bureau (TTB) is weighing approval of a third American Viticultural Area in the High Desert region northeast of Los Angeles. If approved, the Antelope Valley of the California High Desert AVA would join the Leona Valley and Sierra Pelona AVAs established in 2008 and 2010, respectively. 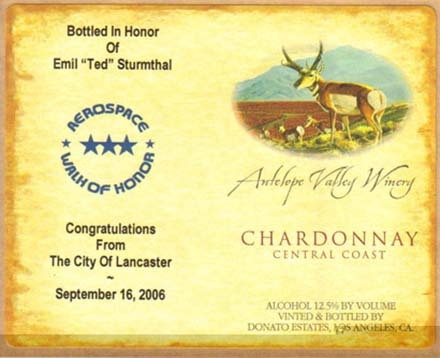 The Antelope Valley Winegrowers Association (AVWA), founded in 2006, was behind all three proposals, supported by nurseryman Ralph Carter, who drew up the petitions. A fourth application for a Tehachapi/Cummings Valley AVA, which would include part of neighboring Kern County, is currently on hold because it does not contain sufficient vineyard acreage.